"Iceland is a doomsday scenario for the rest of the world," says Andres Arnalds calmly. He should know, since he is the deputy director of the Soil Conservation Service in Iceland. And the country desperately needs such an agency. It has the biggest desert in Europe. Yes, a large chunk of the country - almost a third - is an official desert. Sand, sand dunes, no vegetation - the works; and in the sub-Arctic. The only difference with the Sahara is that the sand here is black. Pitch black - with glaciers towering above and the sea shimmering in the distance. And the wind howling in between. It wasn't always thus. Despite the rather frightening name of the country, Iceland was green when Vikings came to settle. About 60% of the country was covered in bushes, trees, grass and all that. As one of the sagas says: "At that time, Iceland was covered with woods, between the mountains and the shore." There were no native people and no grazing animals. But the Vikings, aside from chopping down trees for their own needs, also brought along their sheep. And what do sheep do best? They eat anything that is green. As a result, there is incredible soil erosion that started centuries ago. Andres Arnalds says that Iceland is a prime example of what would happen to the rest of the world if people in other countries, on other continents, continue cutting down trees and overusing the land at the rate they are doing it now. In some respects, Iceland is, of course, almost unique. The soil is volcanic. Andres Arnalds says that "soil samples from eroding areas were tested in wind tunnels in Texas, US, and they found out that only soil samples from the Moon blew as easily as the Icelandic soils. "Iceland has a big resemblance to the Moon. That's why Armstrong came to Iceland to exercise before he went to the Moon." At first a lot of people blamed the sheep. They're let loose to roam free, all summer long, high in the mountains. This is exactly where the vegetation and the soil is most fragile. Then in late summer, early autumn sheep farmers mount their horses and go, cowboy-like, into the hills, in search of their flocks. Very picturesque, if not exotic, but tough on the environment. 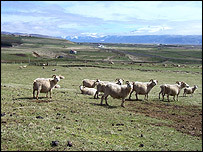 But nowadays sheep farmers are trying to be responsible, like Johannes Sveinbjornsson, who with his wife and kids tends 700 sheep in Thingvellir county. "You cannot blame the sheep, because we should rather blame the man if there has been some problems arising because of sheep grazing," he said. "It has always been the man who has controlled it, or should have controlled it. I think that in most cases sheep grazing now is not a problem with respect to the land." The country is now criss-crossed with fences, to keep the sheep away from the desertified areas. But that is not all. 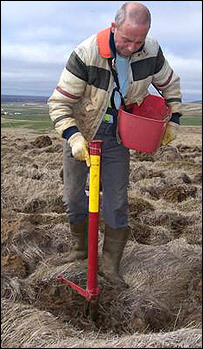 A century ago Iceland established its Soil Conservation Service - the first in the world. It gives advice to farmers on how to tend to the land. And it also tries to roll the desert back, as Andres Arnolds explains: "The main method being used is to fertilise and re-seed. And it's amazing how little is often needed to start the land." The headquarters of the Soil Conservation Service is just outside the village of Hella, about two hours' drive from the capital. Today the area is surrounded by fields, sporting something agricultural, but less than a century ago the entire area had to be evacuated because of the advancing sand dunes. Now the fertiliser and seeds are being prepared here, for future dissemination in the desertified areas of the country. "The stubble is cleaned out of the seed, and it's graded into different classes of quality," explained Sveinn Runolfsson, the head of the service. "It is sent to another building here for coating - we coat it with hydroscopic material to help the germination, to make the seed of similar weight as the fertiliser granules." There is one problem with this approach, though. How can one get the fertiliser and seeds to the eroded, desert areas? Iceland is big and sparsely populated. There are few roads. So, Icelanders decided to "bomb their own country", dropping the fertiliser and seeds from a WW II DC 3 Dakota. Thanks to this antique bomber this country should now get a little greener. 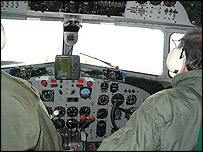 The pilots are all volunteers, doing this work for fun - and perhaps because of a little feeling of guilt. "People feel guilty because when you read the sagas, they say that country was covered with trees that have disappeared now," says Gudmundur Halfdanarsson, a historian. For about a century now, tree planting has been the mass-participation activity. Almost everyone is at it. Presidents, farmers, bus drivers, bankers, school children - you name it. Gudmundur Halfdanarsson explains: "Farming was extremely important for the identity of Icelanders before, so now it's very popular to own a summer cottage in the countryside, and grow trees around it and you know, play this kind of romantic peasant." The first tree in Reykjavik was planted in 1884 and now the city is relatively green. You cannot say that about the countryside: it is still as naked and open as it has been for centuries. 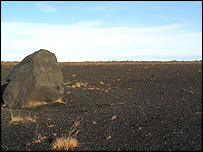 "The Icelandic people like their open areas, open spaces. Many Icelandic people who travel to countries like Sweden or Finland get claustrophobic in the forests," explains Jon Geir Petursson, of the Icelandic Forestry Association. "This is a cultural thing - how people experience their environment. And we are very well aware of the fact that we need to keep those open spaces that we have." On the other hand, trees grow very slowly in the Icelandic climate. So slowly that after a century of tree planting, the locals tell you that if you do get lost in an Icelandic forest all you have to do is stand up. The Biggest Desert In Europe can be heard on BBC World Service at 0805GMT/0905BST on Wednesday, 3 August, 2005, and is available from that time online or as a podcast at the World Service documentary archive.